This little car is a veteran of many local tours and rolls comfortably at 35 miles an hour, but there was another Model 20 Hupp that made history with a significant promotional round-the-world tour. Starting November 10, 1910, and returning to Detroit on January 24, 1912, the world traveling Hupp visited 26 countries and traveled 49,000 miles. 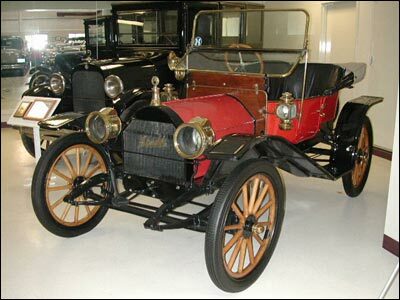 Horseless carriages of the vintage of this 1910 Hupmobile became obsolete quickly as a result of numerous major improvements in the emerging automobile industry. Soon cars were available with electric headlights (these acetylene gas lights had to be lighted with a match). By 1912, there were even cars with self starters that virtually did away with the hand crank. Obsolescence resulted in a high rate of scrapping for earlier cars. Legend has it, however; that when this particular Model 20 Hupp became out of date, its then Northern Ohio owner simply hoisted it to the rafters at the top of his barn. There it hung “just a swingin” for over 40 years. When it was finally lowered it had become a valuable collectable antique. There were 5240 Model 20 Hupmobiles built. Selling price was $750. This remarkably preserved 1910 Hupmobile Runabout is on loan to Swope’s Cars of Yesteryear Museum, courtesy of the Jerry and Martha Baker Collection, Paris, Kentucky.